The Apple watch appeals to a limited demographic and does not incorporate any of the life-saving services that it promotes in its marketing campaigns. To broaden its appeal to a wider demographic, I created a new native Apple Watch safety dashboard for a more curated safety experience targeted directly to families and loved ones. Many people do not yet see the Apple Watch as necessary or relevant to their lives. How can I re-position the Apple Watch’s native features to make it relevant for a wider demographic? In this project, I proposed additional safety features to the native Apple Watch and iPhone experience to make the product relevant for every member of the family. In order to understand how the Apple watch positions itself as a brand, I looking into their marketing campaigns. While the messaging of the “Dear Apple” commercial was aspirational, most users didn’t find it useful for safety. After seeing that the Apple Watch markets itself as a lifesaving device, I surveyed its existing features and categorized its features. Its SOS function was overly-simplistic and does not address the various situations in which SOS could be relevant for different people. Skagen, FitBit, and Jawbone all had very clear positions on how they approached their service offerings and provided an extensive native app experience that comes bundled with the watch. How could the Apple Watch become more targeted with their native app experience? Skagen’s hybrid watch is meant to simplify the experience of owning a smart watch, while still maintaining the nostalgia of a traditional watch face. It includes some of the core features that people typically use like tracking steps, playing music, text vibration, and setting alarms. FitBit is centered around fitness, and includes an extensive platform for tracking various data points related to you activity levels. One of its major weaknesses is that it doesn’t use the data to give users qualitative advice on what to do about their fitness goals. 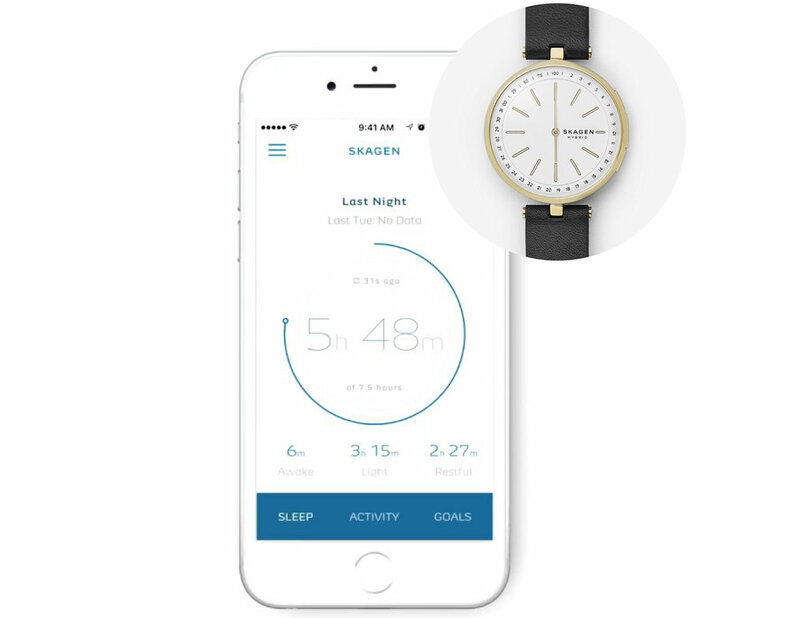 Jawbone takes a more holistic approach to health by including sleep and food tracking in addition to activity tracking. The combination of these three data sources allows it to create qualitative insights that are personalized to each user and his or her lifestyle. Since the goal of this project was to capture the market that does not yet see the Apple Watch as a relevant part of their lives I talked to people who don’t have an Apple Watch and asked them why they don’t want or need one. Here’s some of the feedback I got. Many interviewees didn’t want their phone strapped to their wrist. They wanted a little bit of separation considering that a lot of their free time is spent on their phones already. My additional safety features should address this issue by limiting how often a user needs to actively engage with the Apple Watch. Most people only thought a few of the features would be useful. After asking them which ones, they mentioned Siri, step tracking, listening to music, and navigation. This might indicate that a lower tiered watch could be relevant for some who don’t want to pay for features they won’t use. For some, their primary reason for not buying was the price point. When asked how much they would pay for it, most indicated a range of $90 to $150. This also indicates that a lower tier watch could capture a wider audience. Some mentioned fitness bands like a FitBit, and that it was more relevant for their needs and more affordable. They also mentioned losing interest in step tracking a few months in, which may indicate that fitness tracking is not strong enough of a selling point anymore. Since the Apple Watch targets a very specific demographic, I wanted to expand its reach to a wider audience. So I created personas outside of the Apple Watch’s typical user base. I listed features that were the most relevant to each user group: young teens, parents, and the elderly. For millenials, their needs were basic. Things like calling a car, or getting directions, or playing music. These could be included in a lower tier Apple Band. For parents, knowing where their kids were at all times and being able to keep tabs on how Grandpa’s health is doing, were all incentives for them. For grandparents, health monitoring could be used as a safety mechanism that also connects our mom and grandpa personas to each other. This informed what I how I organized the information architecture of my new features. I then did quick wire frames of the user flow and started to understand how this proposal could be organized for each user group. Essential features would be included in a lower-tier Apple Band. This proposal responds to some of the feedback I got from my user interviews: most people do not see a need for all of the features and want it to be more affordable. Safety features would include partnerships with three relevant apps to create a curated safety experience for the Apple Watch. 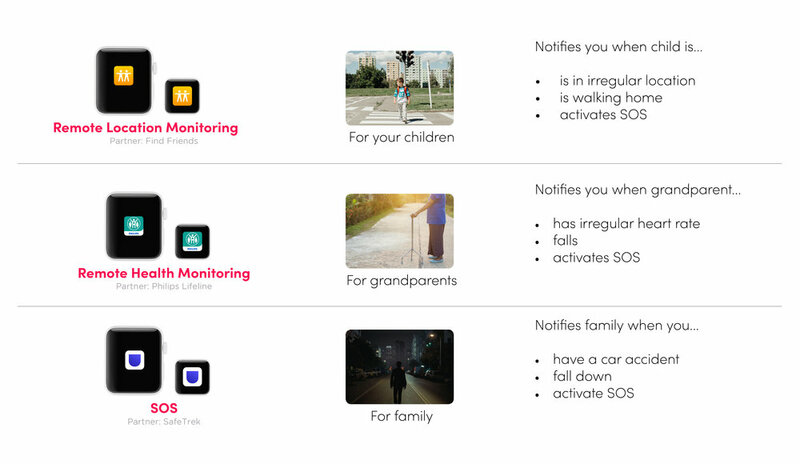 Location monitoring for the kids, health monitoring for the grandparents, and SOS for parents and the whole family. I also introduced a a mid-level Apple Band at a lower price point, that includes essential features for the kids or grandparents, like playing music, navigation, or voice activated calling. The limited features would enable a mid-level price point for the band, making it more accessible to a wider audience. Apple’s health app receives data from various apps within its app store, which doesn’t allow for them to create a native app experience that is meaningful for its users. Part of this proposal was for Apple to form exclusive partnerships with health and safety apps, so that they could curate their native health app experience. In order to find user experience gaps in my design proposal, I mapped out the user journey of my primary user persona, as if she were using my proposed features. After going through this process, it became clear that I had missed opportunities in many of the stages (shown below in blue). These opportunities would be integrated into the next iteration. With each of the different partnerships I proposed, I needed to find a way for all of the features to integrate into one cohesive dashboard for monitoring the entire family all at once. I used an information architecture diagram to understand how my features would be categorized. 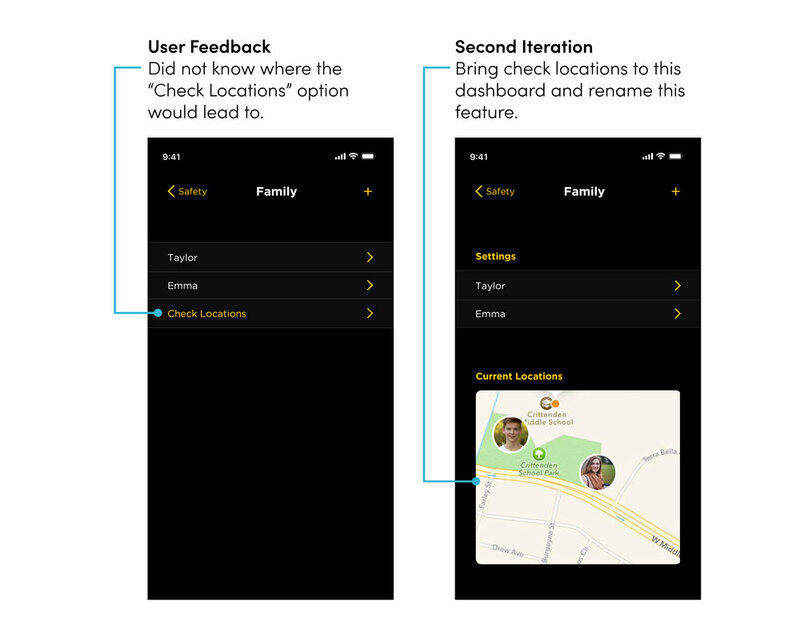 Since the safety features dashboard is where users control their Apple Watch safety experience, I got feedback from users to finalize the dashboard design before moving on to pages deeper within the app. I did a preliminary round of user testing and showed them 4 different iterations of the main dashboard. All interviews were recorded and documented so that I could go back and study behaviors and reactions. I built an interactive prototype and told users about the scenario in which they would use this. I asked them to complete 2 tasks. I noted each user’s main challenges with the interface and revised the wireframes accordingly. Change Taylor’s schedule on Monday in the location monitoring feature. Change your notification settings for Grandma’s heart rate and falls. The first safety feature incorporates location monitoring for children. The iPhone interface allows parents to set an estimated time frame for when their kids should be in specific place. If their location throughout the day is drastically different than what is expected, parents are notified through the Apple Watch. The second safety feature addresses aging in place for the aging baby boomer population. Monitoring grandparents would be enabled by an existing service that Philips Lifeline provides. This service sends emergency care providers to the elderly when a fall is detected or an SOS alert is pressed. In this example, Mom can indicate a range for Grandma’s heart beat and if it deviates significantly, emergency care providers will be sent to her house and Mom will be notified. The last safety feature allows users to opt into notifying friends or family when they feel like they are in danger. When the user sends out an SOS call, the app would update friends and family with their location. After getting feedback from users, revised the interactive prototype. To see the final prototype, click here. Some app experiences are meant to fade into the background, especially when it is about safety or health. People don’t want to think about it unless they need to. Since Apple has an established design language, interactions that were similar to the existing UI made it easier for users to quickly understand. Thinking through use-case scenarios and user journeys after some of the initial product had been designed was useful for understanding where gaps are in the design proposal.